Locking a work object locks its cover too. Work status values can be used to indicate how far a flow action has progressed or has been evaluated while performing validation. Some of the predefined work status values include Open, Pending-Approval, and Resolved-Withdrawn. To add a custom work status value to indicate a status unique to your application, create a work status field value for the pyStatusWork property. Several values are available in the auto-complete field while setting work status. Determine if your application would benefit by adding a new work status value. In this example, you add the value Open-Resubmitted. To add a new work status, create a field value for the pyStatusWork property. Click +Create > Data Model > Field Value. Label – Enter the name of your new work status (for example, Open-Resubmitted). Specify the class for which the field value should be defined. The Apply to class should be the -Work class for your application or case. In the To cell of the Field Value form, enter the work status value (for example, Open-Resubmitted), and then click Save. Create additional work status field values by repeating the steps above, or selecting Save As from the Save menu and entering new Label and To values. Work status can be set in the properties panel for your flow shape. 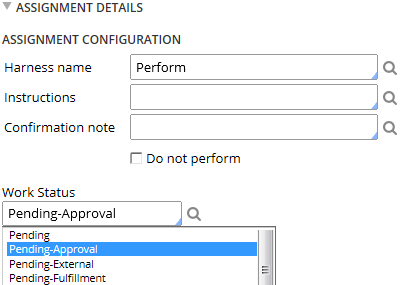 For example, in the properties panel of a Get Approval assignment, work status can be set to Pending-Approval. 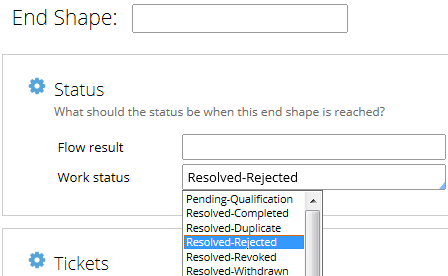 If a request is rejected, work status can be set to Resolved-Rejected in the properties panel of the End Shape for the flow. Now that you have a custom work status value, it is available when you set work status. 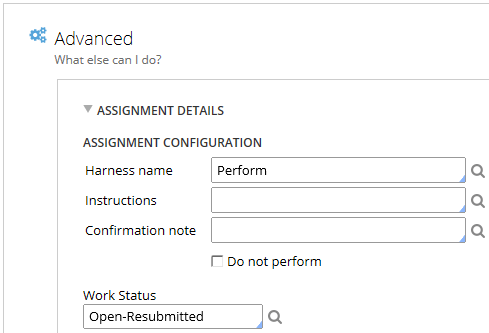 In this example, the new Open-Resubmitted work status value can be set in the Advanced section of the assignment properties panel for a request that has been resubmitted. When the Case Manager runs the process, the work status value can be seen in the Status column of the case contents.